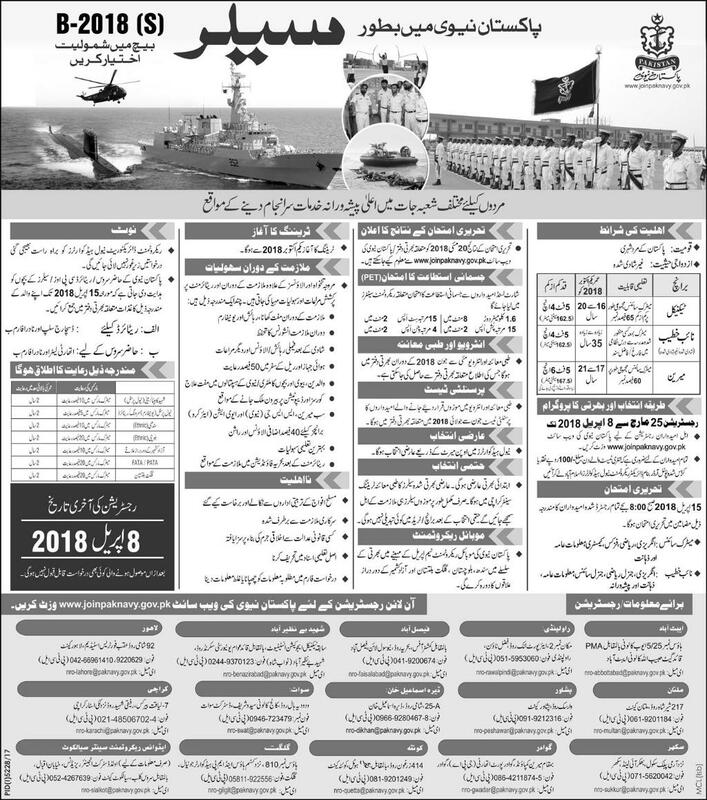 Join Pakistan Navy, Pakistan Navy has announced New Jobs in Daily Express Newspaper 25 March 2018. Pakistan Navy is a Force who is Always Keeping Pakistan Sea Safe and Peaceful from Enemies of Pakistan. Candidates who have Required Qualification and Experience may apply for Pakistan Navy Jobs 2018 as Technical, Marian, and Khateeb. Intending Candidates may apply by online registration by www.joinpaknavy.gov.pk. Pakistan Navy Offers Attractive Salary Packages during Job Tenure as Well As 50% Less in Rail and Air Ticket as well as Free Medical Facilities to Employee Family. Free Family Residence. Further Candidates are directed to Visit Pakistan Navy Website for more Details and Description. Written Test and Further Recruitment Process will be Held in All Recruitment Centers of Pakistan Navy located at different Cities of Pakistan. Head Quarter Qasim Army Aviation Base Dhamyal Camp Rawalpindi 04 Jobs, 05 Jan-18 Express.